They say that dreams don’t work unless you take action. 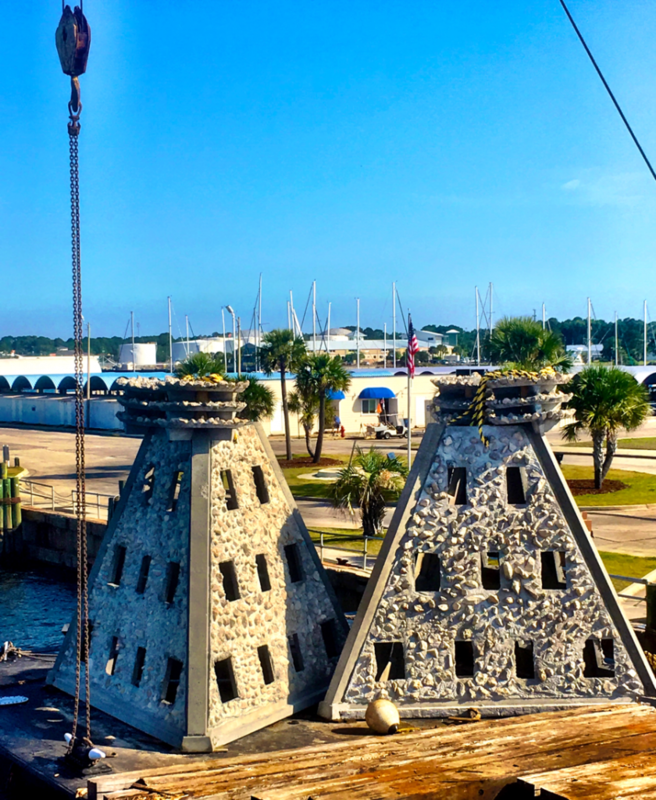 In the case of some Walton County Florida dreamers, their actions have transpired into the first Underwater Museum of Art (UMA) installation in the United States. 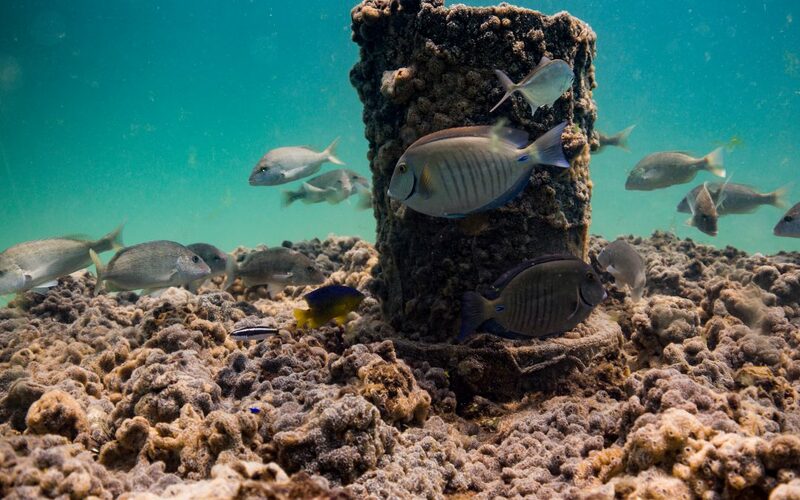 In 2017, the Cultural Arts Alliance of Walton County (CAA) and South Walton Artificial Reef Association (SWARA) partnered to solicit sculpture designs for permanent exhibit in a one-acre patch of sand approximately .7-miles from the shore of Grayton Beach State Park at a depth of 50-60 feet. The Museum gained immediate notoriety and has recently named by TIME Magazine as one of 100 “World’s Greatest Places.” It has also been featured in online and print publications including National Geographic, Lonely Planet, Travel & Leisure, Newsweek, The New York Times, and more. Seven designs were selected for the initial installation in summer of 2018 including: “Propeller in Motion” by Marek Anthony, “Self Portrait” by Justin Gaffrey, “The Grayt Pineapple” by Rachel Herring, “JYC’s Dream” by Kevin Reilly in collaboration with students from South Walton Montessori School, “SWARA Skull” by Vince Tatum, “Concrete Rope Reef Spheres” by Evelyn Tickle, and “Anamorphous Octopus” by Allison Wickey. Proposals for a second installation in the summer of 2019 are currently being evaluated. 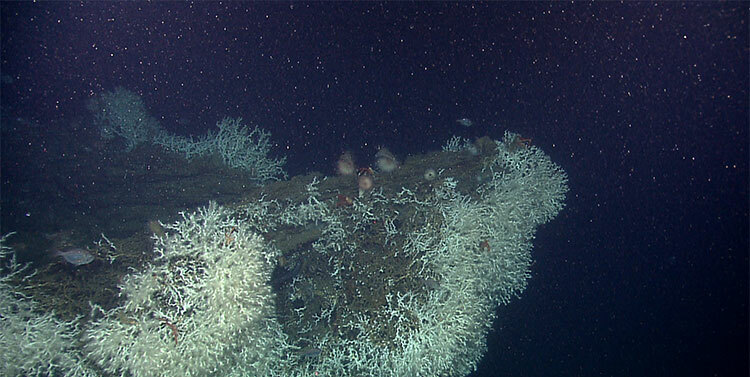 The UMA is a diver’s dream and is in close proximity to other Walton County artificial reefs. There are currently four near-shore snorkel reefs available for snorkeling and nine reefs within one mile of the shore in approximately 50-60 feet of water for additional SCUBA opportunities. 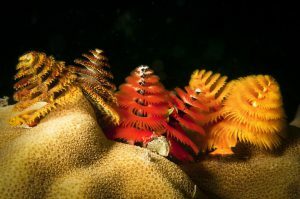 All reefs are public and free of charge for all visitors with coordinates available on the SWARA website (https://swarareefs.org/). Several SCUBA businesses in the area offer excursions to UMA and the other reefs of Walton County. 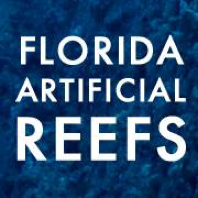 For more information, please visit the UMA website at https://umafl.org/ or connect via social media at https://www.facebook.com/umaflorida/. What’s Up with the Red Tide in the Panhandle? Red Tide has been a persistent presence in the Panhandle since September and responsible for many reported fish kills and respiratory distress in some people. Over the past week, red tide was still present in low to medium concentrations in or offshore of Escambia County to Bay County. Red tide is a natural occurrence and Florida experienced red tides long before humans settled here. The tides originate 10-40 miles off shore and winds and currents bring them inshore. Red tide is fueled by nutrient typically stemming from land-based runoff. During winter, the northerly winds and southbound currents will push the tide back offshore. There was hope that Hurricane Michael might help carry the red tide back out to sea. Unfortunately, it seems the nutrient run-off from the storm’s heavy rain or retreating storm surge may have contributed to the intensity and duration of the bloom. In our economy, which is heavily dependent on tourism, the red tide is continuing to take a toll, especially on waterfront businesses. According to the Florida Fish and Wildlife Conservation Commission, store-bought and restaurant served shellfish are safe to eat during a red tide bloom because shellfish are monitored for safety and tested for red tide toxins before they are sold. The edible parts of crabs, shrimp and fish are not affected by the red tide organism and can be eaten, but guts should be discarded. Many remember the local red tide bloom in 2015. 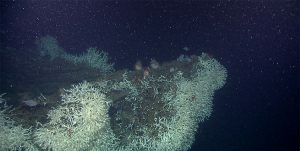 The longest red tide bloom ever recorded lasted 30 months from 1994 to 1997. Warmer water due to climate change is predicted to cause algae to bloom more often, more intensely, and in more water bodies. It is imperative that we reduce nutrient inputs to our lakes, rivers, estuaries and coastal ocean waters today. It is now late May and in recent weeks I, and several volunteers, have been surveying the area for terrapins, horseshoe crabs, and monitoring local seagrass beds. We see many creatures when we are out and about; one that has been quite common all over the bay has been the “stingray”. The cownose ray is often mistaken for the manta ray. It lacks the palps (“horns”) found on the manta. These are intimidating creatures… everyone knows how they can inflict a painful wound using the spine in their tail, but may are not aware that not all “stingrays” can actually use a spine to drive you off – actually, not all “rays” are “stingrays”. So what is a ray? First, they are fish – but differ from most fish in that they lack a bony skeleton. Rather it is cartilaginous, which makes them close cousins of the sharks. So what is the difference between a shark and a ray? Not all rays have the whip-like tail that possess a sharp spine; some in fact have a tube-shaped body with a well-developed caudal fin for a tail. There are eight families and 19 species of rays found in the Gulf of Mexico. Some are not common, but others are very much so. Sawfish are large tube-shaped rays with a well-developed caudal fin. 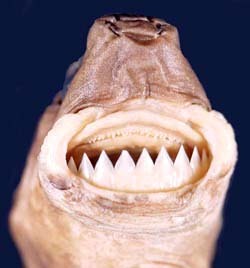 They are easily recognized by their large rostrum possessing “teeth” giving them their common name. Walking the halls of Sacred Heart Hospital in Pensacola, you will see photos of fishermen posing next to monsters they have captured. Sawfish can reach lengths of 18 feet… truly intimidating. 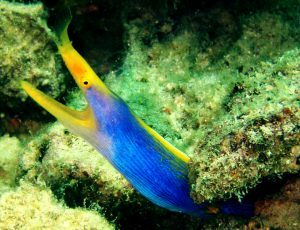 However, they are very slow and lethargic fish. They spend their lives in estuaries, rarely going deeper than 30 feet. They were easy targets for fishermen who displayed them as if they caught a true monster. Today they are difficult to find and are protected. There are still sightings in southwest Florida, and reports from our area, but I have never seen one here. I sure hope to one day. There are two species in the Gulf of Mexico. Guitarfish are tube-shaped rays that are very elongated. They appear to be sharks, albeit their heads are pretty flat. 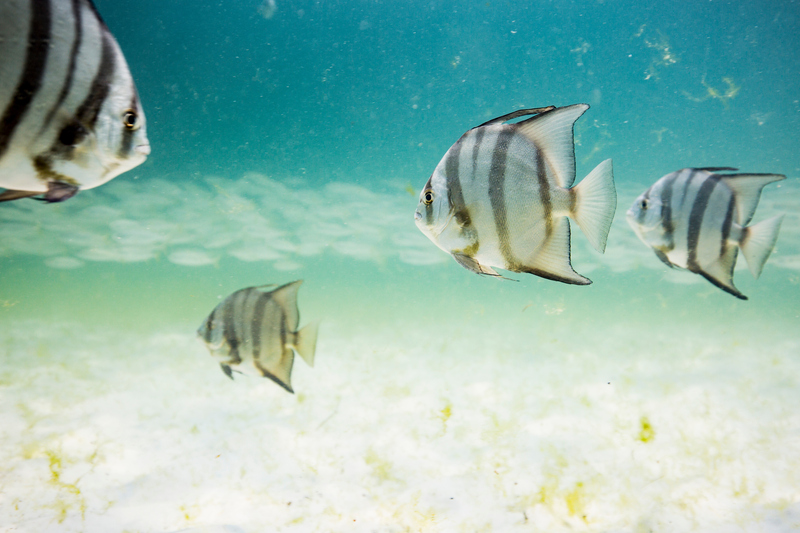 They more common in the Gulf than the bay and, at times, will congregate near our reefs and fishing piers to breed. They are often confused with the electric rays called torpedo rays, but guitarfish lack the organs needed to deliver an electric shock. They have rounded teeth and prefer crustaceans and mollusk to fish. There is only one species in the Gulf. Torpedo rays can deliver an electric shock – about 35 volts of one. Though there are stories of these shocking folks to death, I am not aware of any fatalities. Nonetheless, the shock can be serious and beach goers are warned to be cautious. 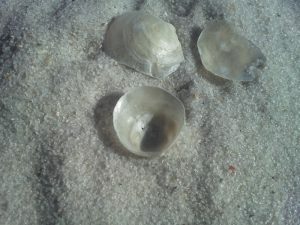 I once mistook one buried in the sand for a shell. Let us just say the jolt got my attention and I may have had a few words for this fish before I returned to the beach. We have two species of torpedo rays in the Gulf of Mexico. Skates look JUST like stingrays – but they lack the whip-like tail and the venomous spine that goes with it. They are very common in the inshore waters of the Florida Panhandle and though they lack the terrifying spine we are all concerned about, they do possess a series of small thorn-like spine on the back that can be painful to the bare foot of a swimmer. Skates are famous for producing the black egg case folks call the “mermaids’ purse”. These are often found dried up along the shore of both the Gulf and they bay and popular items to take home after a fun day at the beach. 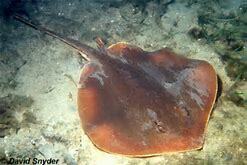 There are four species of skates found in the Gulf of Mexico. Stingrays… this is the one… this is the one we are concerned about. Stingrays can be found on both sides of our barrier islands and like to hide beneath the sand to ambush their prey. More often than not, when we approach they detect this and leave. However, sometimes they will remain in the sand hoping not to be detected. The swimmer then steps on their backs forcing them to whip their long tail over and drive the serrated spine into your foot. This usually makes you move off them – among other things. The piercing is painful and spine (which is actually a modified tooth) possesses glands that contain a toxic substance. It really is no fun to be stung by these guys. Many people will do what is called the “stingray shuffle” as they move through the water. This is basically sliding your feet across the sand reducing your chance of stepping on one. They are no stranger to folks who visit St. Joe Bay. The spines being modified teeth can be easily replaced after lodging in your foot. Actually, it is not uncommon to find one with two or three spines in their tails ready to go. Stingrays do not produce “mermaids’ purses” but rather give live birth. There are five species in the Gulf of Mexico. The Atlantic Stingray is one of the common members of the ray group who does possess a venomous spine. Butterfly ray is a strange looking fish and easy to recognize. The wide pectoral fins and small tail gives it the appearance of a butterfly. Despite the small tail, it does possess a spine. However, the small tail makes it difficult for the butterfly ray to pierce you with it. There is only one species in the Gulf, the smooth butterfly ray. Eagle rays are one of the few groups of rays that actually in the middle of the water column instead of sitting on the ocean floor. They can get quite large and often mistaken for manta rays. Eagle rays lack the palps (“horns”) that the manta ray possesses. Rather they have a blunt shaped head and feed on mollusk. They do have venomous spines but, as with the butterfly ray, their tails are too short to extend and use it the way stingrays do. There are two species. The eagle ray is brown and has spots all over its back. 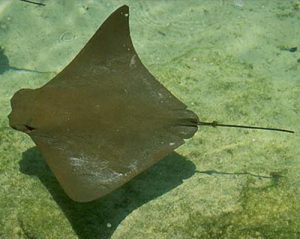 The cownose ray is very common and almost every time I see one, I hear “there go manta rays”… again, they are not mantas. They have a habit of swimming in the surf and literally body surfing. Surfers, beachcombers, and fishermen frequently see them. Last but not least is the very large Manta ray. This large beast can reach 22 feet from wingtip to wing tip. Like eagle rays, they swim through the ocean rather than sit on the bottom. They have to large “horns” (called palps) that help funnel plankton into their mouths. These horns give them one of their common names – the devilfish. Mantas, like eagle and butterfly rays, do have whip-like tails and a venomous spine, but like the above, their tails are much shorter and so effective placement of the spine in your foot is difficult. Many are concerned when they see rays – thinking that all can inflict a painful spine into your foot – but they are actually really neat animals, and many are very excited to see them. Hoese, H.D., R.H. Moore. 1977. Fishes of the Gulf of Mexico; Texas, Louisiana, and Adjacent Waters. Texas A&M. College Station, TX. pp. 327. Shipp, R. L. 2012. Guide to Fishes of the Gulf of Mexico. KME Seabooks. Mobile AL. pp. 250. There are five species of sea turtles that nest from May through October on Florida beaches. 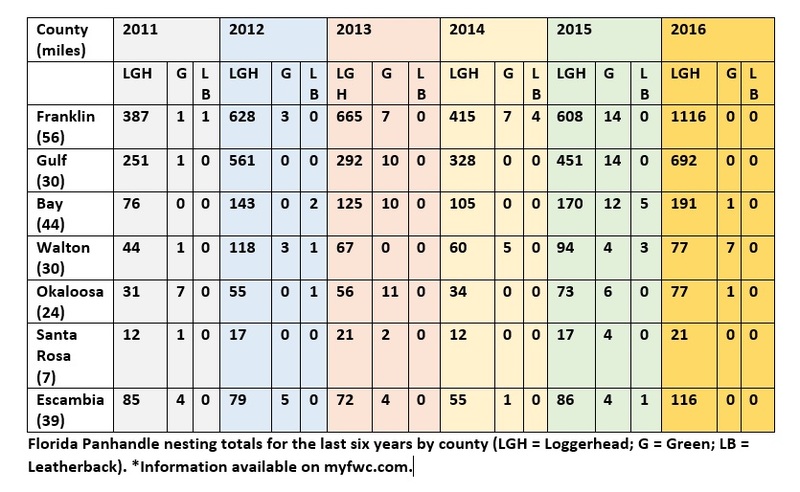 The loggerhead, the green turtle and the leatherback all nest regularly in the Panhandle, with the loggerhead being the most frequent visitor. 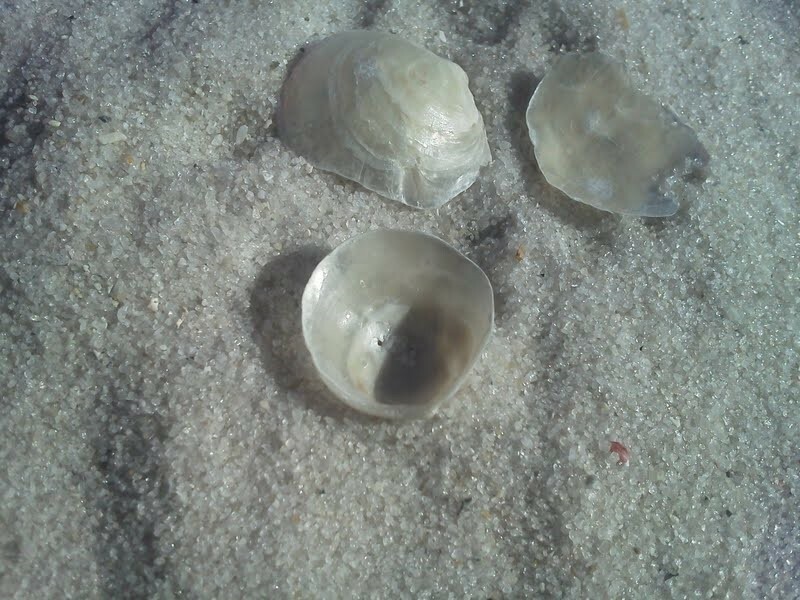 Two other species, the hawksbill and Kemp’s Ridley nest infrequently. All five species are listed as either threatened or endangered under the Endangered Species Act. Due to their threatened and endangered status, the Fish and Wildlife Conservation Commission/Fish and Wildlife Research Institute monitors sea turtle nesting activity on an annual basis. They conduct surveys using a network of permit holders specially trained to collect this type of information. Managers then use the results to identify important nesting sites, provide enhanced protection and minimize the impacts of human activities. Statewide, approximately 215 beaches are surveyed annually, representing about 825 miles. 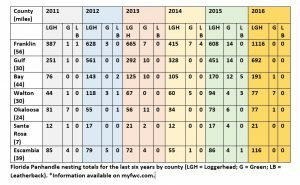 From 2011 to 2015, an average of 106,625 sea turtle nests (all species combined) were recorded annually on these monitored beaches. This is not a true reflection of all of the sea turtle nests each year in Florida, as it doesn’t cover every beach, but it gives a good indication of nesting trends and distribution of species. If you want to see a sea turtle in the Florida Panhandle, please visit one of the state-permitted captive sea turtle facilities listed below, admission fees may be charged. Please call the number listed for more information. 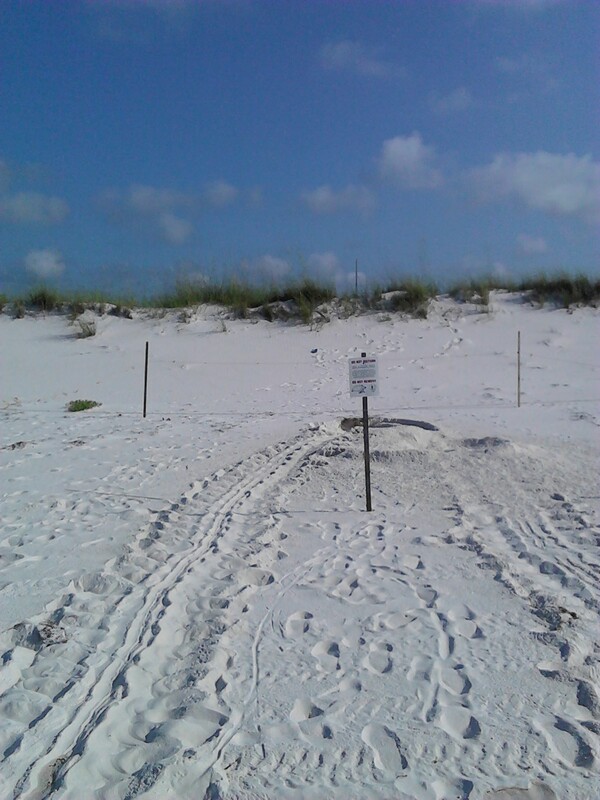 To watch a female loggerhead turtle nest on the beach, please join a permitted public turtle watch. During sea turtle nesting season, The Emerald Coast CVB/Okaloosa County Tourist Development Council offers Nighttime Educational Beach Walks. The walks are part of an effort to protect the sea turtle populations along the Emerald Coast, increase ecotourism in the area and provide additional family-friendly activities. For more information or to sign up, please email ECTurtleWatch@gmail.com. An event page may also be found on the Emerald Coast CVB’s Facebook page: facebook.com/FloridasEmeraldCoast.